A completely invisible immobiliser system designed to protect from key cloning/theft carefully hidden in the vehicles stock wiring loom to remain near impossible to find and disable. How Does the Ghost Work? To operate the Autowatch Ghost you simply enter your chosen code using your vehicles existing buttons either on the steering wheel or on the dash board. Once the pin has been accepted you will get a visual signal indicator to acknowledge the pin which then allows you to start the vehicle. IF YOU DO NOT ENTER THE PIN THE VEHICLE WILL NOT START WHICH MEANS NO ENGINE STARTING NO KEY CLONING NO DRIVING. 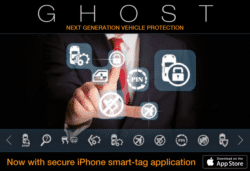 Autowatch Ghost will automatically arm itself every time you switch off the ignition and leave the car; therefore you never need to remember to set the immobiliser. What Does the Ghost Do? The Ghost has no key-fobs or LED indications to give away its location. The Ghost uses the buttons in your vehicle such as those on the steering wheel, door panels or center console, to allow you to make a unique, changeable, PIN code sequence that must first be entered before you can drive your car. Just like your credit card but you can make your car PIN even safer by making it up to 20 presses long! The Ghost will prevent the starting if the engine unless the unique, user defined PIN code has been entered first. The Ghost is sealed and so small it can be installed and wrapped into the vehicle harness anywhere in the vehicle making it near impossible for a theif to find.